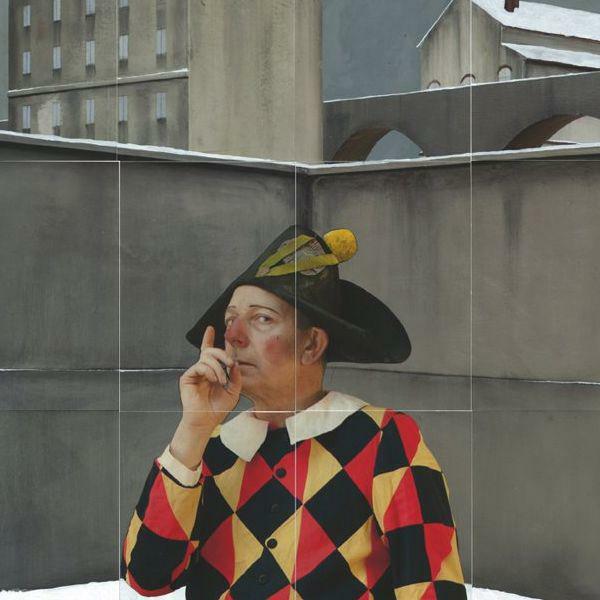 Paolo Ventura (1968, Milan, Italy) invents stories. Like all good storytellers, Ventura was raised on them and appears to have a natural gift for narrative. Each of his pictures holds its own little mystery, a concoction of atmosphere, character and detail that urges for closer examination. Ventura, like a true master illusionist, makes things disappear in front of our eyes. Death and vanishing are recurring themes in his work. He explains it as an omnipresent “fear of losing someone he loves”, which he translates onto his photographs. Ventura studied at the Milan’s Accademia di Belle Arti di Brera in the early 1990s. Solo exhibitions include the Forma International Center for Photography, Milan; Museum of Contemporary Art of Roma (MACRO), Rome; The Hague Museum of Photography, The Hague; Galleria Nazionale d’Arte Moderna, Rome and during the Rencontres de la Photographie, Arles. In 2012, he was selected by curator Vittorio Sgarbi to create a series of works for the Italian national pavilion at the 54th Venice Biennale. His work is included in the collections of the Boston Museum of Fine Art, USA; Library of Congress in Washington, D.C., Lowe Art Museum, Miami, USA: MACRO Museo d’Arte Contemporanea di Roma, Italy; Maison Européen de la Photographie, Paris, France: Museo Palazzo Fortuny, Venice, Italy and Instituto Centrale per la Grafica in Rome, Italy. In 2014 he collaborated with the celebrated director and prestigious award winner Rob Ashford on the creation of the scenography for the Lyric Chicago Opera Theatre. Ventura received other important commissions from the Museum of Contemporary Art of Rome and the Mart, the museum of modern and contemporary art of Trento and Rovereto, Italy. In 2017 Ventura was commissioned by the Teatro Regio of Turin for the stages, costumes and video for the opera Pagliacci by Leoncavallo. Four monographs of Paolo Ventura’s work have been published: War Souvenir (Contrasto, 2006), Winter Stories (Aperture and Contrasto, 2009), The Automaton (Peliti Asociati, 2011) and Lo Zuavo Scomparso (Punctum Press, 2012). Small and limited publications have appeared with publisher Danilo Montanari Editore such as Il Mago (2013), An Invented World (2013) and Death of an anarchist (2015).